3 in 1 Deep Cleansing Balm For All SkinTypes Including Sensitive Removes All Make Up, Mascara, Sunscreen & Daily Grime Tones & Improves Circulation Exfoliates Gently for Daily Skin Refinement. Key Actives *Oils of Seabuckthorn, Acai, Andiroba, Vitamin E, Rosehip, Calendula, Bisabolol, Ricebran, Apricot, Ylang Ylang, Neroli, Tangerine, Grapefruit, Orange Blossom. Available in both 50ml and 100ml, Simple & Sublime is a luxurious and intoxicatingly aromatic, naturally coloured orange, deep cleansing balm. Just add a splash of water and it transforms into a deliciously light rinse off cleansing milk. It adheres to surface impurities, make-up, even sunscreen is no match for this beautiful balm. The combination of Vitamin E-rich Ricebran and Castor oils provide the deep cleansing. The Apricot, Calendula and Bisabolol provide soothing comfort, toning and skin refinement and the Acai, Sea Buck-Thorn Oil, Rosehip, Andiroba and Copaiba Balsam oils provide superior conditioning, anti-ageing and anti-microbial properties including mega doses of antioxidants, GLA’s and EFA’s. 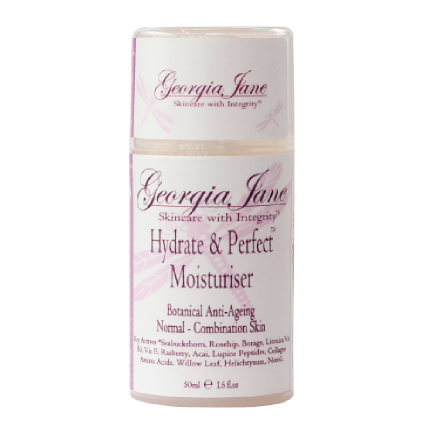 GeorgiaJane Skincare have three types of moisturiser available, depending on your skin type, providing a complete multi-functional & anti-ageing product designed to be used day & night. Please read through each to see what suits you best. If you are unsure as to what your skin type is please try out our “whats you skin type page” to find out. 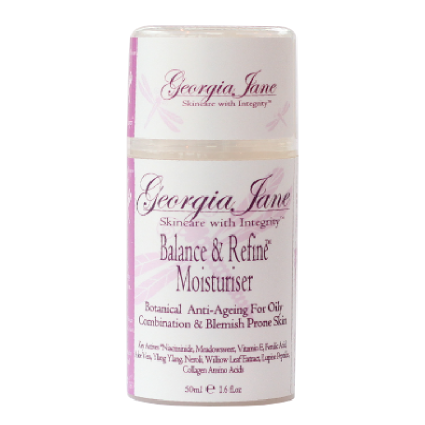 Balance & Refine is a silky smooth, matte-finish moisturiser that will get your problem skin under control, balance and mattify your skin, minimise the appearance of large pores and also address the ageing concerns of the very oily to oily acne prone skin-type. This multi-functional product utilizes a powerful bio-active blend of pure natural & antioxidant rich ingredients to both improve hydration levels, help to control sebum production and restore clarity and luminosity for a more even skin tone. Hydrate & Perfect is a multi-functional yet silky smooth, non greasy moisturiser formulated with a powerful bio-active blend of pure natural & antioxidant rich ingredients utilizing the anti-ageing, smoothing, hydrating and plumping effects they impart to the skin. Powerful anti-ageing actives such as Lupine Peptides, Dipalmitoyle Hydroxyproline, Niacinimide and Glucosamine also address the ageing concerns of the normal to slightly oily/combination skin type. 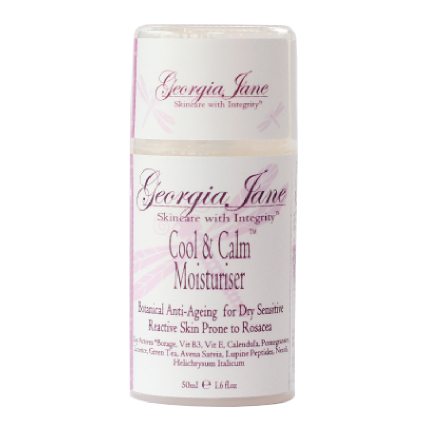 Cool & Calm is a multi-functional yet silky smooth, non greasy moisturiser packed with potent bio-actives and anti-ageing ingredients to help soothe and comfort even the driest, most temperamental & sensitive reactive skin while also helping to restore your natural clarity & luminosity. A GeorgiaJane Treatment Oil is a hardworking healing blend of the purest unrefined natural & antioxidant rich botanical oils & 100% Pure Therapeutic Grade Essential Oils, carefully chosen for the anti-ageing, healing, soothing, hydrating and plumping effect they impart to the skin. Get your oily to combination, acne or blemish prone skin under control. Most oily skinned people run for the hills when they see the words oils and skin in the same sentence. Stop! Oils are your friend….Balance & Refine Treatment Oil is a bio-active synergistic blend of pure unrefined antioxidant-rich, healing botanical oils such as Chia, Tamanu and Pomegranate Extracts, carefully chosen to hydrate yet balance, regulate sebum production, heal current blemishes and help prevent or lessen future outbreaks while protecting the skins environmental barrier. Even the oiliest skin needs hydration. Skin that overproduces sebum needs to avoid the trap of stripping oil from the skin in the mistaken belief that this will ‘dry out’ the skin. This just perpetuates the cycle of the skin producing more oils to compensate. Hydrate & Perfect is a hardworking healing blend of the purest unrefined natural & antioxidant rich botanical oils & 100% Pure Therapeutic Grade Essential Oils, carefully chosen for the anti-ageing, healing, soothing, hydrating and plumping effect they impart to the skin. These sensational nutrient rich oils work synergistically to feed the skin with among others, GLA, EFA, Omega 6 & 9, Linoleic Acid and Phytosterols, all of which will leave your skin looking & feeling smooth, plumped, hydrated and dewy looking. Cool & Calm is a hardworking bio-active and healing blend of pure unrefined natural & antioxidant-rich botanical oils & 100% Pure Therapeutic Grade Essential Oils, carefully chosen for the anti-ageing, healing and soothing, yet hydrating and plumping effect they impart to the skin and are beneficial for even the most sensitive skin. 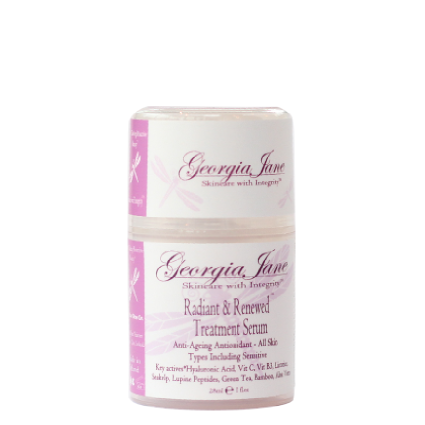 Radiant & Renewed Treatment Serum is an amazingly silky smooth, oil free, treatment serum formulated to bring back the glow to dull looking lethargic skin. This clear honey coloured serum is loaded with antioxidants to fight environmental aggressors and moisture-binding Hyaluronic Acid to hydrate and keep your skin nourished and protected. Get radiant healthy looking skin with high-powered stabilized Vitamin C & a synergistic complex of Niacinimide and Glucosamine which has been clinically proven to help with hyperpigmentation, sun-damage and acneic skin conditions. GJ Revital-Eye & Lip Intense is a highly active, 100% natural complex of botanicals, vitamins and synergistic peptides that reduces the appearance of dark circles and diminishes puffiness and under-eye bags. A highly active, 100% natural complex of botanicals, vitamins and synergistic peptides that reduces the appearance of dark circles and diminishes puffiness and under-eye bags. To be used both AM and PM to the contours both below and above the eye sockets and the lip contours. • Acetyl Tetrapeptide-5, Palmitoyl Oligopeptide, Palmitoyl Tetrapeptide-3,(Matrixyl 3000) & SepiLift(Peptide) actively work in synergy to help reduce wrinkles and crow’s feet and alleviate puffiness. • Cupuacu Butter and botanical Oils of Argan, Safflower, Calendula, Rosehip, keeps the delicate eye and lip area hydrated, smooth and refined. • Sodium PCA and Hyaluronic Acid help firm and hydrate the delicate skin under and around the eyes. • Vitamin C, Licorice Extract, Ferulic Acid, Vit E, Allantoin (Comfrey) all help to reduce the appearance of under eye darkness and caffeine helps alleviate puffiness. • Fast absorbing, non-greasy cream-gel formulation blends flawlessly into skin. • Soothes and refreshes the delicate eye and lip area to help minimize signs of fatigue. GeorgiaJane Revive & Refresh Hydrating Mist and Toner is a multi-purpose, cool and refreshing moisturizing spray that provides a quick pick-me-up for dehydrated, overheated or tired skin. The unique blend of moisturizing and anti-aging ingredients leave the skin hydrated and glowing. Give your skin a cool drink of Antioxidant Rich Botanical Goodness! GeorgiaJane Revive & Refresh Hydrating Mist and Toner is a multi-purpose, cool and refreshing moisturizing spray that provides a quick pick-me-up for dehydrated, overheated or tired skin. The unique blend of moisturizing and anti-aging ingredients leave the skin hydrated and glowing. Vitamin B5, Seakelp, Comfrey and Aloe extracts provide calming benefits, minimizing redness and other signs of stress. Combined with the added moisture-binding power of hylauronic acid, this wholesome blend makes skin feel instantly soft and supple. Skin looks radiant, plump and healthy.